As cute as the animation of THE BREADWINNER is, the film’s charm lies more in the delicious tale set in a foreign county where surprises can occur around every corner. Surprises can be good or bad, but the good ones are elating. THE BREADWINNER is animated feature created from an innovative mix of 2-D animation with acrylic and digitally painted environments, as well as digital paper cut–out segments. It is Nora Twomey’s first solo directorial debut after making two other animated features SONG OF THE SEA (2014) and THE STORY OF KELLS (2009). The story is a current one centred on woman’s rights in a male dominated country. Angelina Jolie, known for her humanitarian efforts executively produced this film. Based on Deborah Ellis’ award-winning novel, the story centres on an 11-year-old Afghan girl Parvana, born into an ever-changing world of conflict and oppression in Kabul, who finds strength in the love of her family and the power of storytelling. Kabul is Taliban controlled and Parvana sees her father suddenly whisked to prison for no reason. Her family – mother, older sister and baby brother are unable to fend for themselves. Parvana dresses up as a boy in order to go around town to buy food and to work as the family breadwinner. It’s just the way it is. That is the reason things are the way they are in Afghanistan. Those are the words uttered to her when she is told that she is unable to visit her father in prison. Still, if there is a will there is a way, especially if money involved. “Don’t do anything that stupid.” “I will find him. Nothing you can do will stop me.” That is her determination to see her imprisoned father. Her spirit is enough to inspire as the film does occasionally. As in most animation, magic plays a big part in the film’s enchantment. 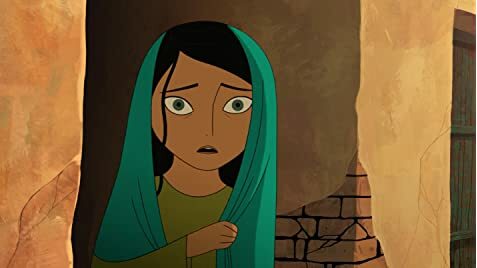 In THE BREADWINNER, the magic comes from the story she tells her little brother. The story is so original and magical that it almost eclipses the main one at hand. The story involves a village that had the village’s seeds for the next year stolen by the jaguars of the evil Elephant King. The boy’s quest is to get the seeds back and thus save the worried villagers from starvation. To overcome the elephant king, the boy has to find things, that shine and ensnare. It is a good story which intercuts to the main one at the climax of Twomey’s film. One wonders though as this is a strong female movie, the reason the hero in the story of the Elephant King was not a female in the first place. The score by Jeff Danna and Mychael Danna features traditional musicians and young voices partly recorded in Kabul. 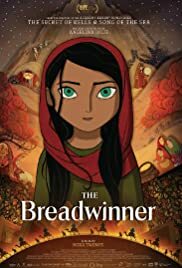 THE BREADWINNER is a story of oppression that stresses the message that one can accomplish wonders from pure determination. It is also one that best be told animated as the story might have turned out too harsh as a full live action film. The animation is beautifully done as the film’s story is one that matters that needs be told.